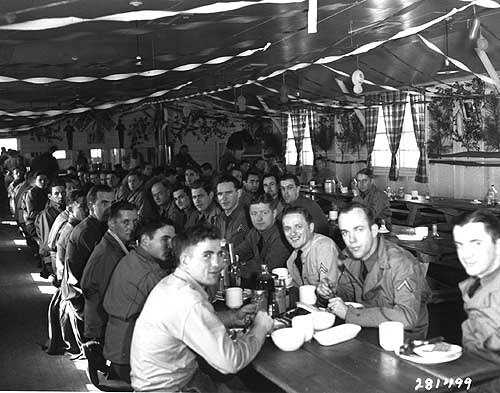 More than sixteen million American servicemen served in World War II. Military casualties totaled more than 407,000: 292,131 battle deaths and 115,187 deaths from other causes. North Carolina lost more than seven thousand men in the war, with thousands more injured. Citizens in the state and across the country also made tremendous sacrifices as well as complete lifestyle changes for the war effort. This session looks at how America came to enter the conflict and the important role that North Carolina played in war preparations. At 0445 hours, September 1, 1939, fifty-three German divisions stormed across the Polish border without a formal declaration of war. Great Britain and France, in accordance with treaty obligations, declared war on Germany. After a period of “phony war” which lasted into 1940, Adolf Hitler’s Nazi legions invaded Norway and Denmark on April 9, 1940, and, on May 10, moved south, quickly subduing Holland and Belgium as they pushed deep into France. By early June, the British Expeditionary Force, under relentless pressure by German tank divisions, was forced to evacuate the continent at Dunkirk; on June 22, France signed an armistice with Germany, leaving Great Britain as the only democratic nation left to oppose Germany and Italy, the latter joining the Nazi invasion on June 10. North Carolinians viewed the cataclysmic events in Europe with sadness and alarm, remembering that Tar Heels had died on European battlefields in World War I, just twenty-three years earlier. Like most Americans they were torn between genuine affection for Great Britain, now “going it alone,” and a deep-seated desire to remain at peace behind the great oceanic barriers. 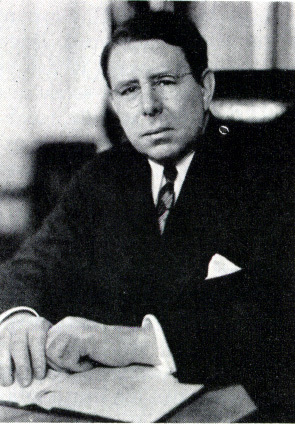 This latter attitude, isolationism, was very nearly a national secular religion during the 1930s, leading Congress to pass the first Neutrality Act in 1935. Indeed, in a Gallup poll taken that year, seventy percent of the respondents felt American intervention in World War I had been a mistake. 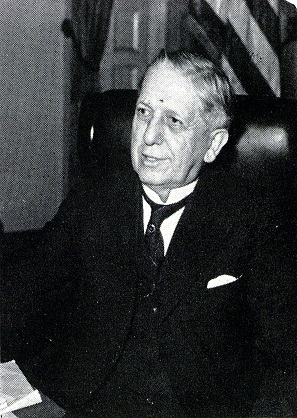 This isolationist sentiment, which effectively blocked foreign policy initiatives by the administration of President Franklin D. Roosevelt until 1939, began to wear thin in the face of Japanese aggression in China, the Italian invasion of Ethiopia, German and Italian military help to General Franco’s forces in the Spanish Civil War, as well as German annexation of Austria and Czechoslovakia. It was the “Munich Crisis” in 1938 which broke American complacency about Nazi intentions in Europe. When Hitler obtained British and French assent to partition Czechoslovakia, Americans began to realize that the appetites of the fascist states could not be forever appeased. "Our example and our action," Hoey explained, "would have a wholesome effect upon the other neutrals and a sobering influence on Germany. . . It is safer to sell supplies than to send men and if England and France can win this war, that is our best security for peace . . I believe in building our defenses at home so strong that we can take care of ourselves in any war that might be forced upon us." This country, while there is time to save Britain and destroy the all-devouring aggressor, is refusing to make itself an active ally of the only friendly great power left in the world. Can anyone with any sanity expect people anywhere to give the United States anything, or to trust it, or to seek its protection, when the United States obviously does not know how to keep from building up its most deadly enemies, when it clearly does not know the first steps toward self-protection. 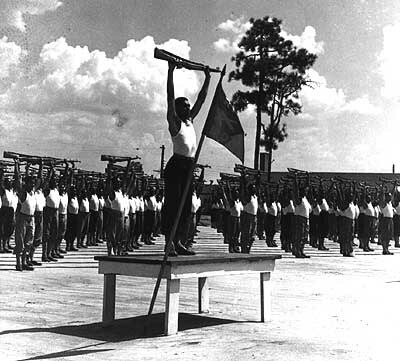 Events in Europe and increasing Japanese aggression in China were propelling the United States toward war in 1940. Americans were stunned by the sudden collapse of France, which showed that the nation was no longer safe. They rallied to President Roosevelt’s call for a program of armaments for national defense and aid for Britain. In mid-September 1940, Congress voted to create a peace-time draft. Then, after he won reelection in November, President Roosevelt proposed a "lend-lease" plan for Britain. Heeding British Prime Minister Winston Churchill’s message that his country was in mortal danger, FDR proposed lending arms directly to Britain, an idea that raised intense opposition in Congress. But, as a Gallup poll showed in mid-January 1941, a majority of Americans favored Lend-Lease. Congress provided $7 billion in aid for Britain in late March; in April, American warships were patrolling the sealanes deep in the Atlantic to insure that military aid got to Britain. On May 27 the president proclaimed an unlimited national emergency. "Approximately three-fourths of all the peoples of this earth are now involved in warfare. More men are in arms today than at any time since the dawn of creation. As we sit peaceably here, the fate of Europe, Asian and Africa—indeed, the fate of civilization itself—is trembling in the balance, whether it be Armageddon or Renaissance, no mortal man can tell. Democracies throughout the earth are not only being challenged; they are being flaunted and overthrown. Not since the beginning of our national history has our own democracy been so gravely threatened. Acutely conscious of the danger, our nation is girding itself for defense and preservation. The Congress of the United States under the leadership of our President in the session of 1940 appropriated for defense the largest sum of money ever before appropriated in a similar length of time by any nation on earth, in peace or war. Such are the solemn circumstances of the hour." the Battle of Kings Mountain in 1780 to the trenches of World War I, the "heroism of North Carolina has been attested by the blood of her sons who died in the front lines of victory." In the present crisis, he noted, military units at Fort Bragg, Camp Davis, the air base at Charlotte, and the Elizabeth City Coast Guard Base were preparing to defend the nation, training thousands of draftees and volunteers. Military base construction was a major defense industry in North Carolina in World War II, a fact of significant economic and social importance. The "Great Depression" of the 1930s had left a legacy of sluggish economic growth and high unemployment in North Carolina. By summer of 1940, tens of thousands of Tar Heels had joined construction companies at Fort Bragg and Camp Davis where prodigious feats of engineering and building were underway. 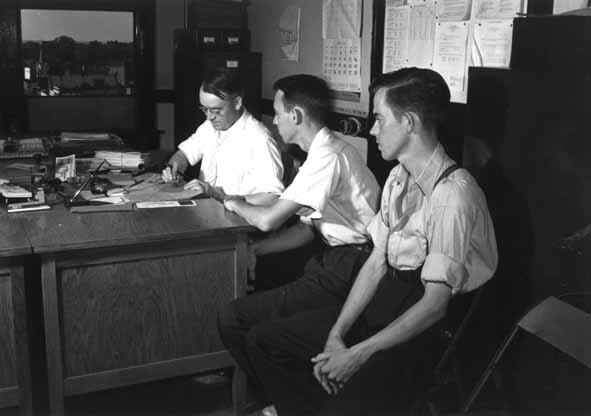 In late 1941 work began on Marine Corps facilities at Havelock and Jacksonville, swelling the ranks of the employed by more tens of thousands. Construction was underway by 1942 at Seymour Johnson Air Base, Camp Butner, Camp Sutton, Camp Mackall and a host of other bases, stations, air fields, and camps stretching across the state, from Manteo to Asheville. The effect of the signing of a construction contract at each of these bases was magnetic, drawing workers from communities up to a hundred miles away to the job sites. . . . In every case, the allure of the military projects was a decent pay check, job training, and the hope for continued work. In a very real sense, these military projects in 1941 represented the end of the depression in North Carolina. Life magazine explained in its June 9, 1941, edition that a "miracle" had taken place at Fort Bragg. At a total cost of more than $44 million, new roads, sewers, theaters, recreation halls, and power lines were constructed. Some 28,500 workers, receiving $100,000 a day, completed the buildings at the rate of one every thirty-two minutes. Sixty-five carloads of building supplies arrived each day on the rails of the Cape Fear and Atlantic Coast railroads. At the conclusion of the project, Fort Bragg was the largest military camp in the nation and North Carolina’s third largest city. The construction of military bases in southeastern North Carolina in the period 1940-41 brought jobs, money, soldiers, and changes, all in massive quantities. At Holly Ridge, the site of Camp Davis, C. C. Hines told reporter Sam Ragan of The Wilmington News that the newly planned Army anti-aircraft artillery training base was "hard to realize. . . It’s like something you read about—you know, like what used to happen out west." Reporting in December 1940, Ragan said that the Holly Ridge site had about it the feeling of a "gold rush." Within five months, 20,000 workers had erected 978 buildings, creating a camp with thirty miles of paved streets, twenty miles of sidewalks, and fifty miles of water mains. Nearby U.S. Highway 17 was widened to handle the influx of supplies and troops. "It’s the most stupendous thing that has ever happened in that section. Millions of dollars are being turned loose every week. Thousands of men have been given employment. Gone completely is the traditional calm and easy-going way of living. The slow-moving tempo of villages and towns has been replaced by a mad rush which seems to have everybody within its grasp. The highways are filled with cars and trucks. New houses are going up everywhere. Near practically every filling station are huddles of trailers and tents where people have taken up temporary quarters. Land sales are almost daily occurrences and it seems as though every third man you meet is in the real estate business." This pattern of social change and upheaval was repeated again and again around the state as new camps got their complement of buildings, roads, utilities, and troops. As 1941 approached its end, the Marine Corps began work on two enormous projects at Camp Lejeune near Jacksonville and Cherry Point at Havelock. Near deep water ports at Wilmington and Morehead City, Camp Lejeune was destined to become one of the largest Marine Bases in the world. Construction began in April 1941, continuing into 1944 and beyond. Cherry Point Marine Corps Air Station was constructed on 8,000 acres beginning in August 1941, with the focal point being the airfield with its eight runways and extensive maintenance facilities which made the station the largest of its type in the Marine Corps. Civilians participated in war preparations in many ways. In addition to constructing military facilities, citizens wrapped bandages, sold war bonds, entertained soldiers at USO events, and organized scrap drives. 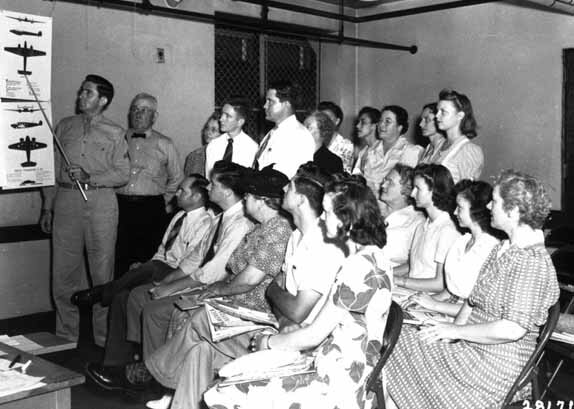 Here, civilians attend a class on identifying enemy aircraft in Wilmington. U.S. Army photo. The enormous military projects in 1940-41 were not completed without causing significant hardship on nearby families. Thousands of acres of land were acquired by the government for bases at Havelock, Jacksonville, and Holly Ridge. Families had to sell their land whether they wanted to or not. Six hundred families were evacuated from their farms to accommodate Camp Lejeune. The very social fabric of the community was shattered, with churches dismantled, clubs dissolved, and farms abandoned. Many of the people whose land was "taken" felt they were underpaid by the government, the cash received being insufficient to start a farm or build a house elsewhere. In Onslow County, bitterness over the land seizures persisted into the early 1990s. Despite the problems caused by the sudden growth of military bases in North Carolina during 1940-41, the overall impact on the state was of the highest economic importance. The Division of Commerce and Industry noted in its annual report for 1941 that Army and Navy contracts totaled nearly $63 million in 1940 and more than $100 million in 1941. Moreover, tens of thousands of men had been employed in construction projects, with others taking permanent jobs working at the bases once completed. Equally important were the thousands of new troops entering the state, stimulating enormous economic growth as contracts were let for food, fuel, building materials, and supplies of all types. Defense preparations resulted in nothing less than a "boom-town" atmosphere. As 1941 drew to a close, training intensified at Fort Bragg and Camp Davis, with thousands of inductees arriving monthly for processing. One of those drafted in 1941 was Marion Hargrove of Charlotte who was serving as city editor of The Charlotte News when he received a government envelope bearing the message, "From the President of the United States to Marion Hargrove, Greetings." Such draft notices were the beginning of the end of civilian life for thousands of Tar Heels during World War II. For Hargrove, it was the start of his trip to the induction center at Fort Bragg and thence to the Field Artillery Replacement Training Center where, despite his journalistic background, he was assigned to duty as a cook. Hargrove wrote down his impressions of Army life in a daily diary which later became a national best seller in the form of the book, See Here, Private Hargrove. 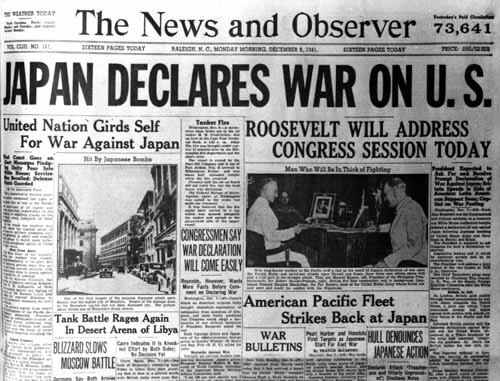 On December 7, 1941, Hargrove reported that the news of the Japanese attack on the American naval base at Pearl Harbor, Hawaii, came as "stunning news." “The unimaginable had happened—America was at war. For the young men at Bragg the ". . . first outrage gave way to the awful fear that they would be sent away, green and untrained and helpless, within a week.”"
Other Tar Heels felt similar fears. Mildred McIver recalled being with a soldier from Camp Davis when the news was reported: "I remember being frightened to death. There was such a state of fear. It was a terrible, terrible fear." Jimmy Allegood, who worked for the Wilmington Morning Star, remembered that "Everything went into high gear. . . it was a national uprising." Others worried about the young men who had been drafted. Katherine Cameron, 23 in 1941, noted that the news of Pearl Harbor, "paralyzed me. . . I can see myself just standing there right now, thinking ‘We’re Americans. We’ve been attacked. This just can’t happen." Reprinted by permission from North Carolina during World War II: On Home Front and Battle Front, 1941–1945 by John S. Duvall, World War II Fiftieth Anniversary Commemorative Committee of the Airborne and Special Operations Museum Foundation, Fayetteville, N.C.: 1996. A scholar in Eastern European studies wrote this article about a little-known chapter of World War II history. This USA TODAY article discusses a recent book of diary and letter excerpts written by ordinary Japanese citizens during the war. Read short memoirs of the war by Europeans. 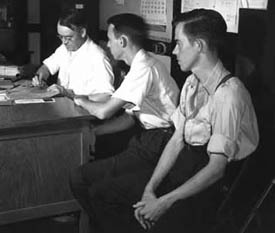 The Illinois Institute of Technology offers interviews conducted in 1946 with Holocaust survivors. The BBC collected these brief accounts of World War II from individuals around the world. *Please contact your local education agency if you are interested in this option to ensure that you can earn reading credits for the workshop. If questions arise, contact Sally Bloom at 919-807-7965 or sally.bloom@ncdcr.gov. If your LEA does allow reading credits for this course and you complete Option 1 of the assignment in this session and Option 2 of the assignment in Session 2, your Certificate of Participation will confirm that you qualify for those credits. If you prefer, develop a virtual field trip to one or more museum or historic site websites anywhere in the world. The Second World War changed American women’s roles in the military, workforce, home, and community. Create a lesson plan in which your students explore how the war altered the lives of women in this country. The lesson can be general or can focus on a specific aspect, such as the military, job opportunities, or social attitudes. Submit your completed assignments via e-mail to sally.bloom@ncdcr.gov.